The elite competition, sponsored by R&D Magazine, recognizes the 100 most innovative technologies of the previous year. 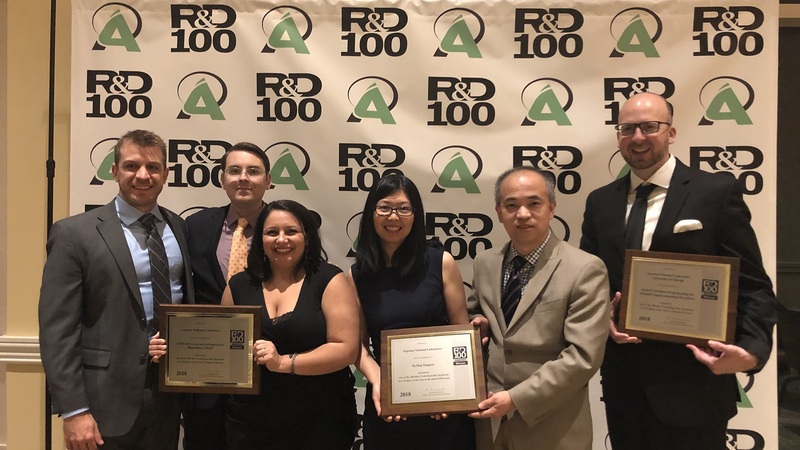 Winning projects have included sophisticated testing equipment; innovative new materials; disruptive chemistry breakthroughs; new biomedical products; breakthrough consumer products and new technologies spanning industry, academia and government. HyMag is a potentially revolutionary technology that significantly increases the usable magnetic flux density of a permanent magnet by 10 to 30 percent, leading to a dramatic improvement in the energy efficiency of electric motors and wind turbine generators. HyMag Magnets are less expensive and more environmentally friendly, consuming 60 to 90 percent fewer heavy-rare-earth materials. Gao has been working in this area of research for roughly 20 years. Zhang has about 15 years of experience in this field. Each joined the laboratory two years ago. Together, they sought to identify materials and structure design that improve efficiency, reduce cost and enable new applications in relation to magnet technology. Darshan is a software product used to understand and improve the performance of the world’s largest data-intensive computing applications in fields such as physics, cosmology, chemistry, biology, aerospace and earth science. It has become the de facto standard for optimizing scientific data access in government, academic, and industry computing centers around the world. The software, created by Philip Carns, Kevin Harms, Robert Latham, Shane Snyder and Robert Ross, can trace its roots back to 2009. Ross, senior computer scientist in the Mathematics and Computer Science division, said there were two key motivations for this work. GRID-M provides public safety officials with the near-real-time status of critical supply chains following major disasters. The model was created by Argonne’s Kyle Pfeiffer, Tom Wall, Carmella Burdi and Scott Schlueter. It is offered at no charge to the Federal Emergency Management Agency (FEMA), which sponsored its development, and it will be free to all federal sponsors. Pfeiffer said he’s thrilled to see the project gain such recognition. By scaling the complex supply chain processes to a manageable paradigm, GRID-M reduces the otherwise daunting computational load associated with providing a wealth of disaster-related information in real time and analyzing recovery and restoration of services. Users can customize the tool to consider the supply chains of greatest significance within their jurisdictions, Pfeiffer said. For example, they can consider the nodes (grocery stores, distribution centers, etc.) and links (roadways, lifeline infrastructure systems, etc.) that have the greatest influence over the resilience of their communities. Swift/T is a software system that scientists use to run calculations on very large supercomputers. It has been successfully used by cancer scientists and combustion engine designers, among others. The technology allows researchers to distribute the computational work of scientific studies and make good use of parallel computing systems. The system was created by Argonne’s Justin Wozniak, Jonathan Ozik, Nicholson Collier, Michael Wilde and Ian Foster in addition to two outside collaborators, Tim Armstrong (Cloudera) and Dan Katz (National Center for Supercomputing Applications at the University of Illinois at Urbana-Champaign). Swift/T allows researchers to distribute the computational work of scientific studies and make effective use of the large scale computing systems available at Argonne, such as Mira, Theta at the Argonne Leadership Computing Facility (ALCF), a DOE Office of Science Facility, and external systems like Summit. It has been successfully used by cancer scientists and combustion engine designers, among other application collaborations both at Argonne and elsewhere. The awards committee also selected Kirill Prozument’s and Daniel Zaleski’s RAINet — an artificial neural network devoted to chemical characterization — as a finalist in the competition.